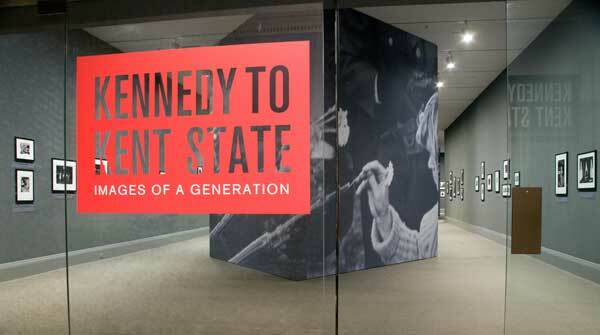 The major exhibition which launched the new season at WAM, Kennedy to Kent State: Images of a Generation, was conceived around a collection of American photographs from the 1960s assembled and donated to the Museum in 2011 by Howard G. Davis, III (known to all as David Davis). The exhibition documented a cultural shift from an age of American innocence before the death of President Kennedy through the challenges associated with the Civil Rights Movement, the Vietnam War, and NASA’s mission to the moon. Featuring over 100 images dating from 1958 to 1975, complete with full catalogue, the exhibition included many images which have come to define the era. Complementing a full schedule of changing exhibitions in the Asian galleries, the American miniatures gallery, the Contemporary gallery, and the Prints, Drawings and Photographs gallery, the Museum mounted the 10th commissioned Wall at WAM: These Days of Maiuma, by the collaborative husband and wife team of Robert and Shana ParkeHarrison. With its iconography of the remains of a grand feast and themes of contemporary wealth, decadence, and disregard for the environment, the inkjet mural is intended to be a visual and conceptual counterpoint to the Worcester Hunt mosaic—once the site of many a feast in 6th-century Antioch, a city known for its lifestyle of sophistication, affluence, and excess. With the debut of the Jeppson Idea Lab, the Museum creates a public forum for sharing questions and ongoing research about single or small groups of objects from the permanent collection. This innovative and collaborative presentation of Orantes: Ancient Statues from South Italy features three rare Greek statues dating to the 3rd century BCE displayed together for the first time after a multi-year conservation, restoration, and technical study campaign. Gallery interpretation for the project, which includes video interviews and iPad interactives, represents the work of a team of conservation, curatorial, and audience engagement staff, as well as the participation of Worcester State University computer science students. Jill Slosburg-Ackerman – In Rome: The Pine Grove. And. Natura naturans; natura naturata.